SWAT 771 strives to reach and impact communities with equal opportunity for education and innovation. Within our school, we have helped organize and promote various events that spread the word and encourage involvement in FIRST programs. SWAT created a book called “Millie Finds a Wrench” in 2017. 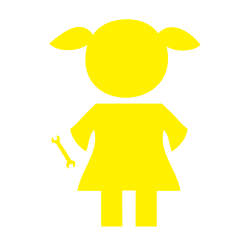 The story follows a curious girl named Millie who builds and takes apart things with a wrench, created to show that curiosity in young girls should be encouraged and not looked down on. The book was read to and distributed to classrooms and libraries across our school. 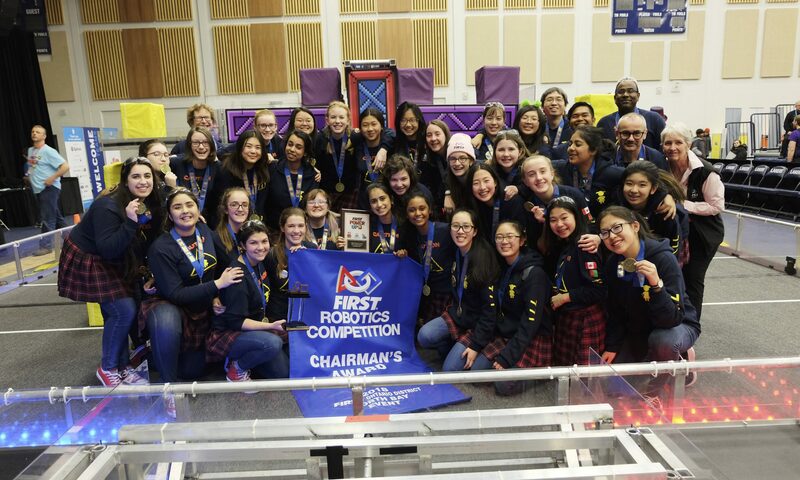 As well as extending the philosophy of gracious professionalism, SWAT frequently puts our robots on display at our school’s open houses as well as other major school events that are open to both the public and the school community. Starting in junior kindergarten following through to high school graduation, we make sure students are able to be involved with robotics, from viewing presentations to building their own robots. We currently have a FIRST based program accessible to every girl in our school. SWAT 771 hosts an annual Robotics Symposium (also known as SWATposium) in the fall for local teams to come together and share knowledge to prepare for the upcoming build season. This event consists of many guest speakers, workshops, team socials and much more. Other teams are able to contribute by running a workshop and sharing what they know to over thirty teams from Canada and the U.S.
To spread knowledge of FIRST to the local community we have displayed the robot on various events including Special Olympics, Midnight Madness and Robo-Expo. We also helped start and now run the CAGIS (Canadian Association for Girls in Science) for two years, meeting with girls aspiring to seek professions in the sciences. A group of SWAT girls was invited to China in July 2017 to mentor and participate in CRC. The girls had an amazing time working with many international and local teams. SWAT ran a a workshop for “Girls in STEM” which advocated for equality in STEM fields. Also, our Team made it the finals of CRC and had an expectational time representing Canada and making lifelong connections. After an all girls team, The Afghan Dreamers (7329), from Afghanistan was denied their visa to enter the United States of America for a competition, SWAT 711 has been incredibly excited to teach, learn and interact with these young girls during the 2018 season in Canada. Helping them with various mechanical and non-technical aspects, seeing their passion and just a fraction of what they are capable of in STEM only motivates us more for equality. Furthermore, SWAT has gone to Hobart, Tasmania in Australia and given a presentation to an all-girls school there about FIRST and SWAT 771. Later we hosted 2 Australian exchange students to join for the 2012 build season in Canada. We have taken advantage of our school’s global connections. When we traveled to Japan with our school, we gave a presentation on FIRST and SWAT. In January of 2017, Chinese exchange students came out to visit us and we gave presentations to over 60 of these international students about our robotics team and FRC. Our team continues to proudly sponsor a young girl in Kenya named Laura. Girls on the team take turns sponsoring and writing a letter to Laura. In the past, we have also run a Lego drive for Kenya, collecting Lego and sending it to Kenya for the children there to learn and play with. From far and near, SWAT 771 has backed FIRST because of our genuine belief in the importance of STEM and gracious professionalism for students.